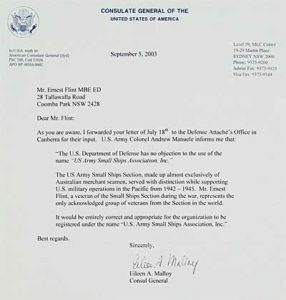 The Association was proposed on the 15th May, 2001 and approval for the name of the Association, “U S Army Small Ships Association Inc.” was sought from the Consul General of the United States of America ,Mrs Eileen A Malloy, and the US Army Military Attache to Australia Colonel Andrew R Manuele. 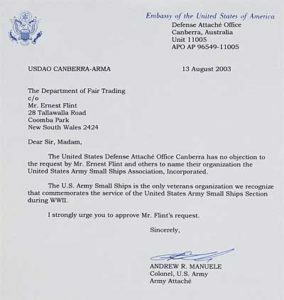 “The United States Defence Attache Office Canberra has no objection to the request by Mr Ernest A Flint MBE ED to name their organisation The US Army Small Ships Association Incorporated”. 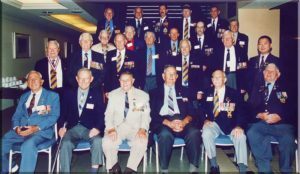 “The US Army Small Ships Section, made up exclusively of Australian Merchant Seamen, served with distinction while supporting US Military Operations in the Pacific from 1942 – 1945. Mr Ernest A Flint a veteran of the Small Ship section during the war, represents the only acknowledged group of veterans from the Section in the World”. “It would be entirely correct and appropriate for the Organisation to be registered under the name “US Army Small Ships Association Inc”. A Certificate of Incorporation was issued by the Department of Fair Trading on the 10th September, 2003. The only Chapter of the American Merchant Veterans Association, outside of the United States. A plaque commemorating this fact was installed on the 15th May 2001, in the presence of The Consul General for the United States of America, Richard L Greene, the U.S. Army Colonel Michael J Baier, Association President Ernest A Flint M.B.E., E.D. and Heinz J Colby representing The Grace Hotel. The composition of the original Committee was as follows ; President Ernest Flint MBE ED, Vice-President Howard Leayr ,Treasurer Patrick Curtis M.B.E., Secretary Daniel O’Brien, Committee Members, Ernest Emerson and Captain John Evans A.M.